Born in Sydney in 1928, Charles Blackman moved to Melbourne where he established a studio in 1951. Blackman found the urban environment congenial to his work which reflected domestic and city life, as well as themes stimulated by the literature he was reading at the time. 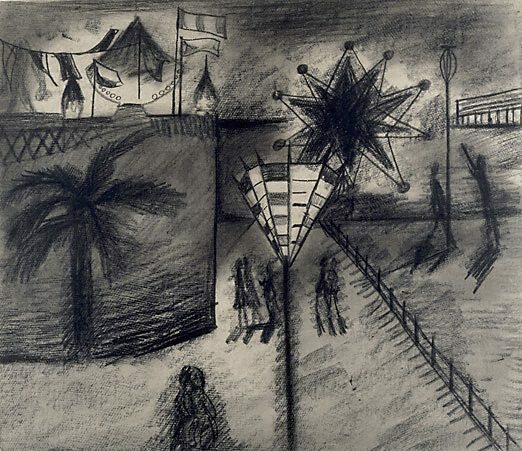 It was during his first year in Melbourne that Blackman discovered the bayside suburb of St Kilda, where he would travel by tram to swim, draw and visit Luna Park. The drawings led to a series of paintings on the same theme. The 'Griffin light' at the centre of the composition refers to the distinctive street lights along the Esplanade in St Kilda, which were designed by the architect Walter Burley Griffin. Signed and dated l.l., pencil "BLACKMAN 53". Luna park and the Art of Mass Delirium , Melbourne, 1998, 46.